I still don’t exactly blend into Lima, Peru. I’m painfully white, my Spanish is broken, and I cross even the tamest city streets like a panicked deer. But despite all that, I’m finally falling into comfortable patterns of life. I know where things are (sort of), and I’m capable of giving just about as many restaurant recommendations as I receive. 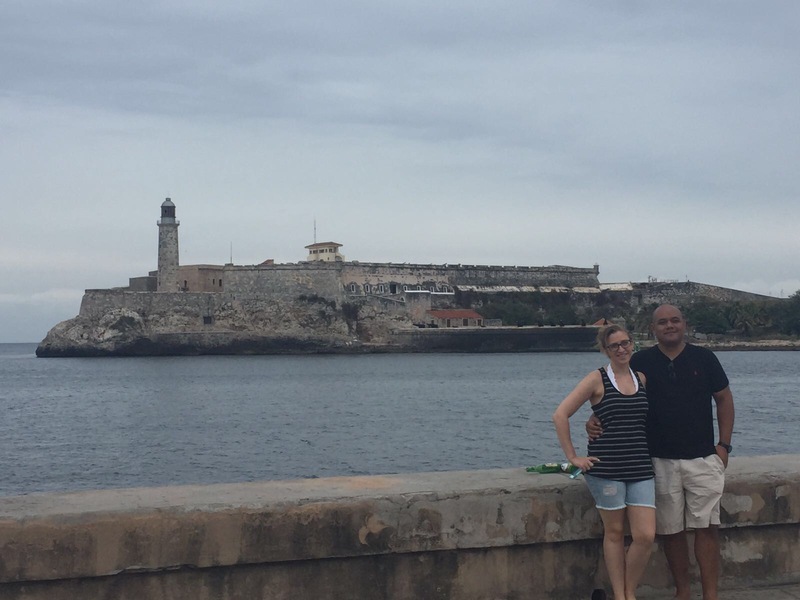 But this April, for our 5-year anniversary, Ivo and I spent a week in Cuba. 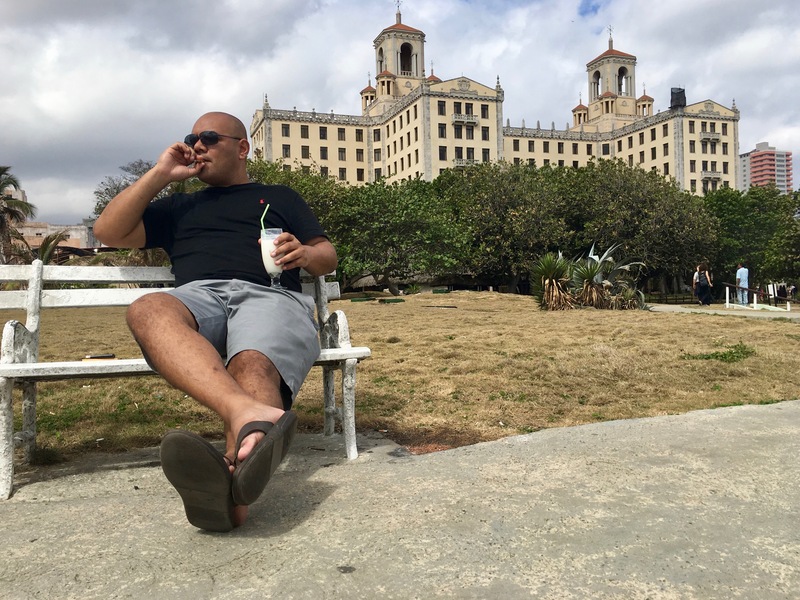 And for a blissful few days in Havana, I reverted to my original form: bumbling American tourist. 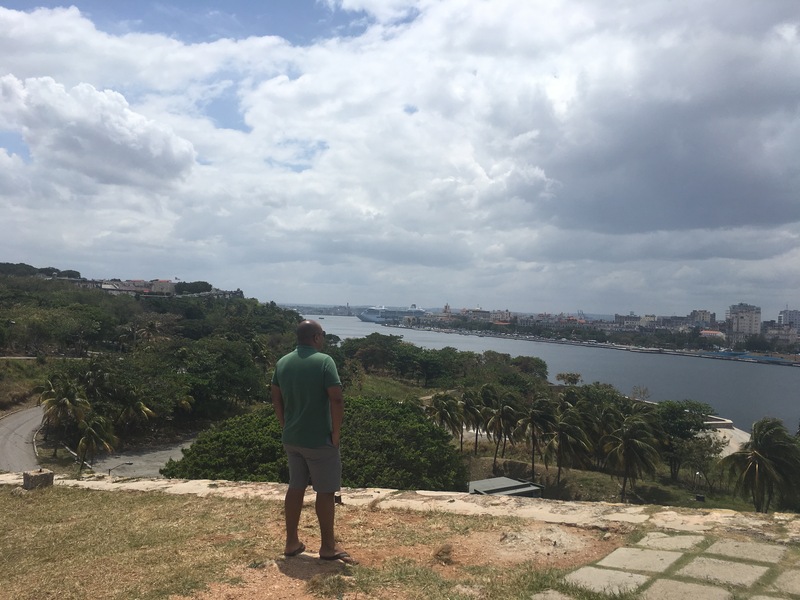 Even Ivo, who was literally mistaken as Cuban a few times, got to enjoy again the feeling of discovering a place from scratch. I do plan to do more research and some deep reflecting on our experience. 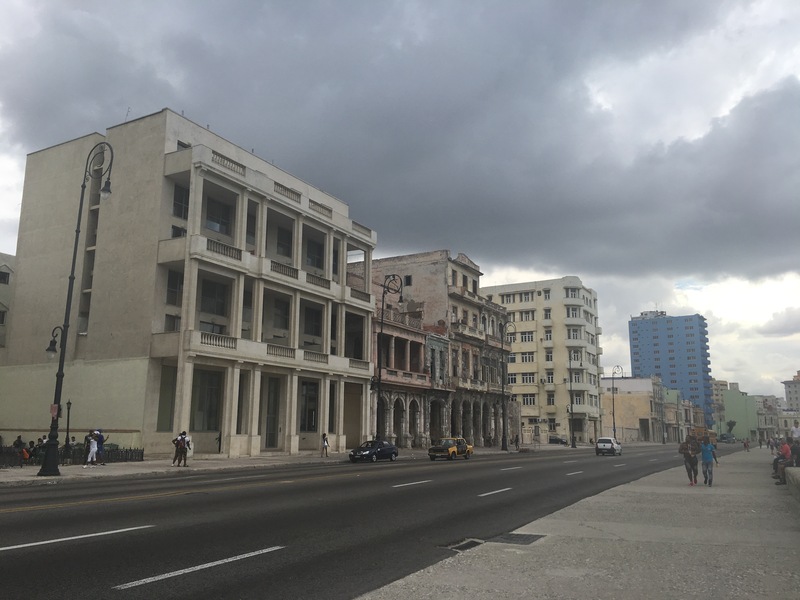 Cuba forces Americans in particular to question and confront a lot about history and how history is written; the content at the National Museum in particular was fascinating. 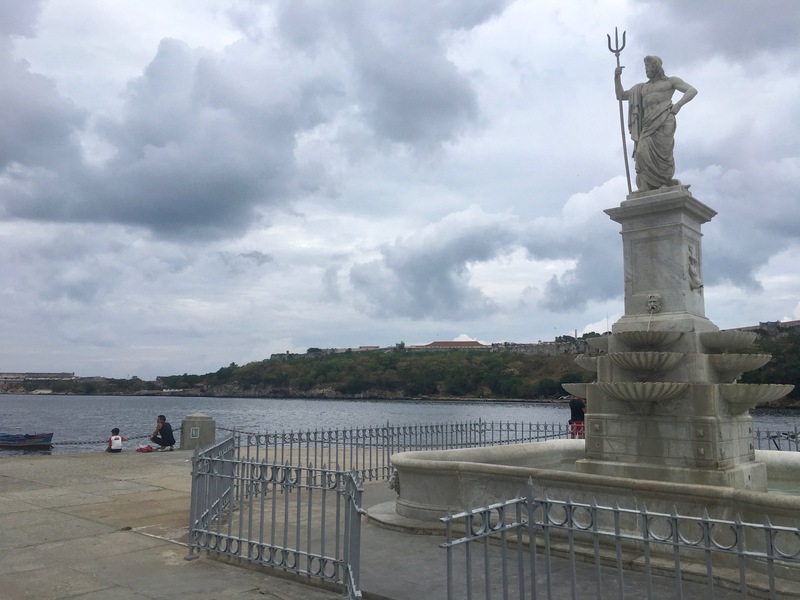 However, for once, I just want to bask in the simplicity of pure tourism: Below are the five most tourist-y things we did in Havana, and I think we covered the menu pretty well. 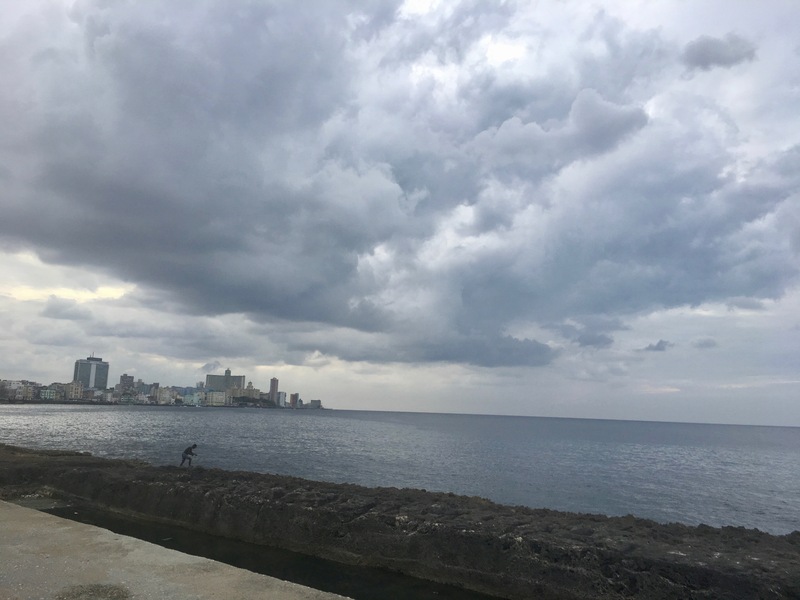 (1) We walked the Malecón. 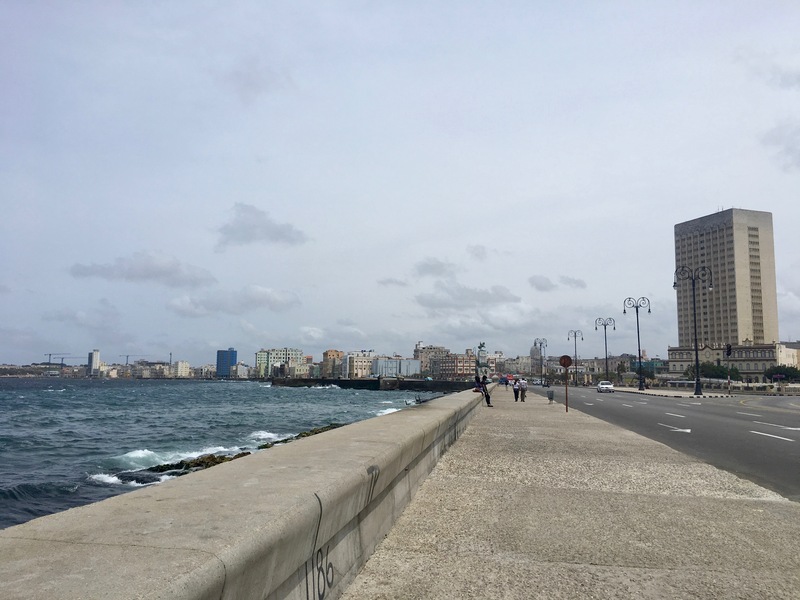 The Malecón is a long sidewalk stretching along the ocean. 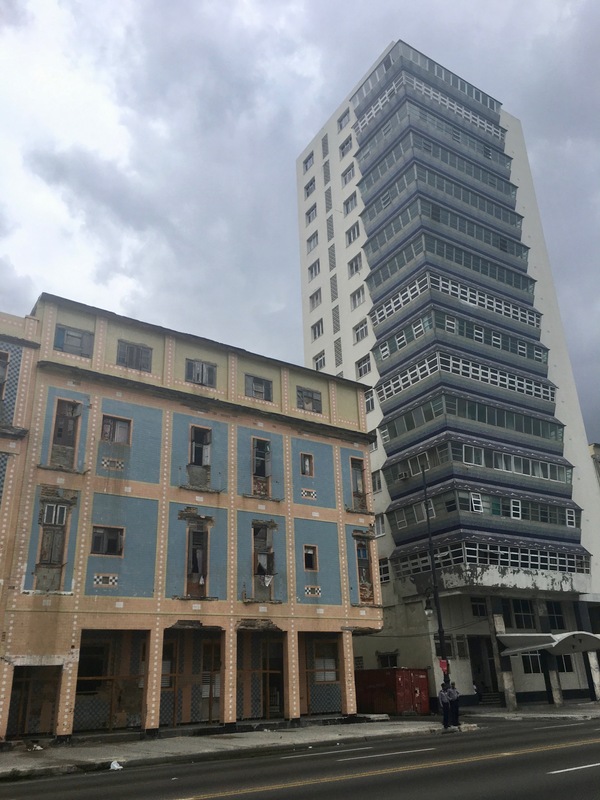 It was constructed in stages, spanning from about 1900 to 1950, so some sections are a little more porous than others. 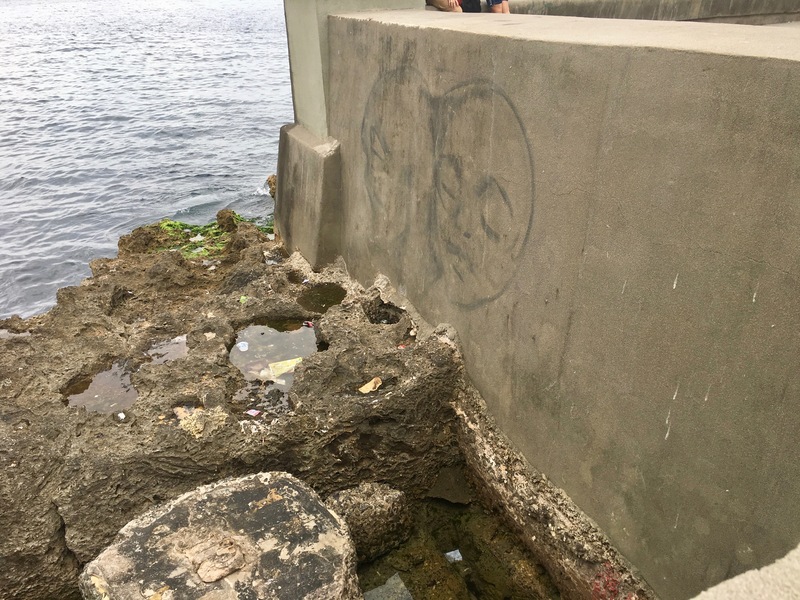 You get smacked in the face by the ocean spray as you go, and that same salty spray has eaten away at the cement and houses lining the street. 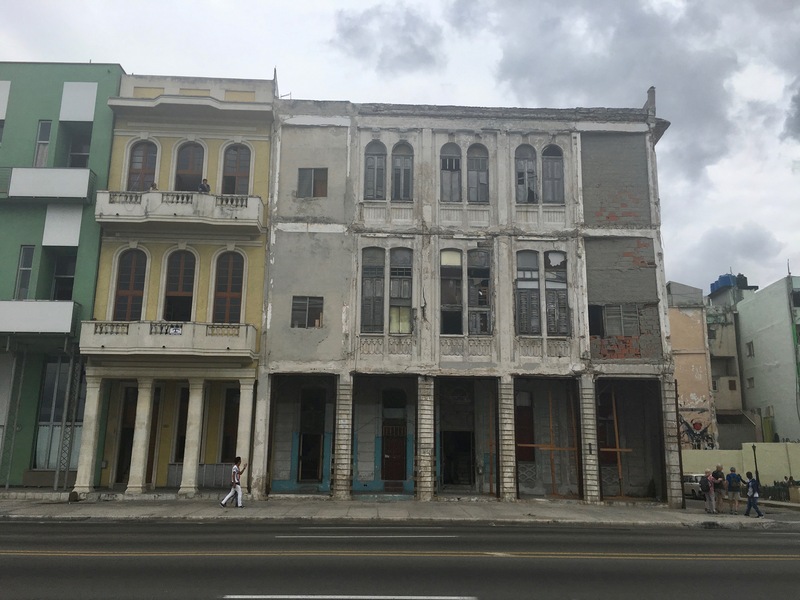 Many of those houses are still ghosts and skeletons, stripped and unoccupied. 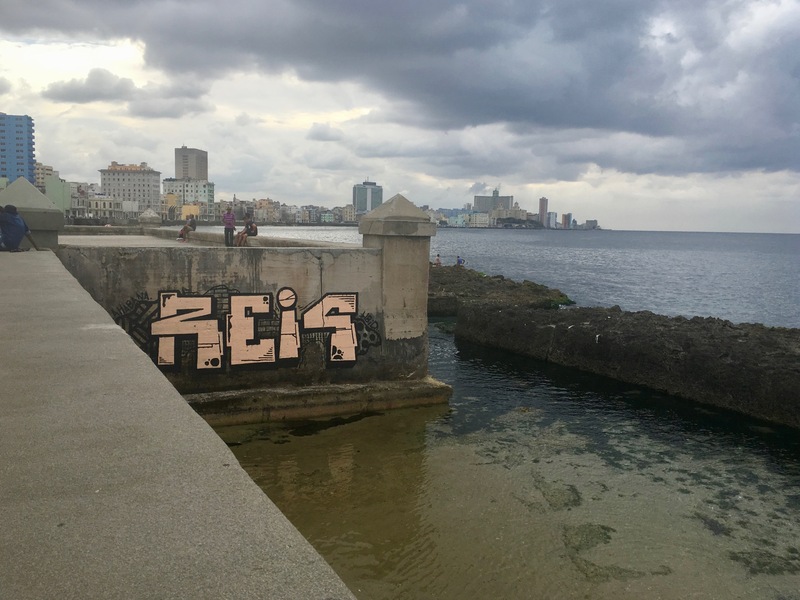 Even so, the Malecón manages to be romantic. 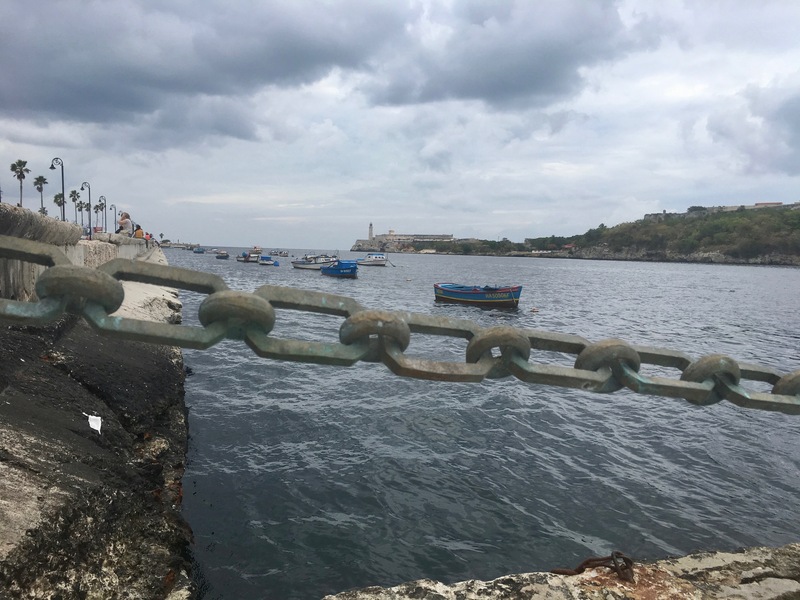 Ivo and I walked most of the way down one day, from our hotel to the fortress (built in ~1600), and then all the way home to our hotel another day, spanning almost the entire Malecón. A felled lamppost, waiting for repair. (2) We visited Revolution Square. 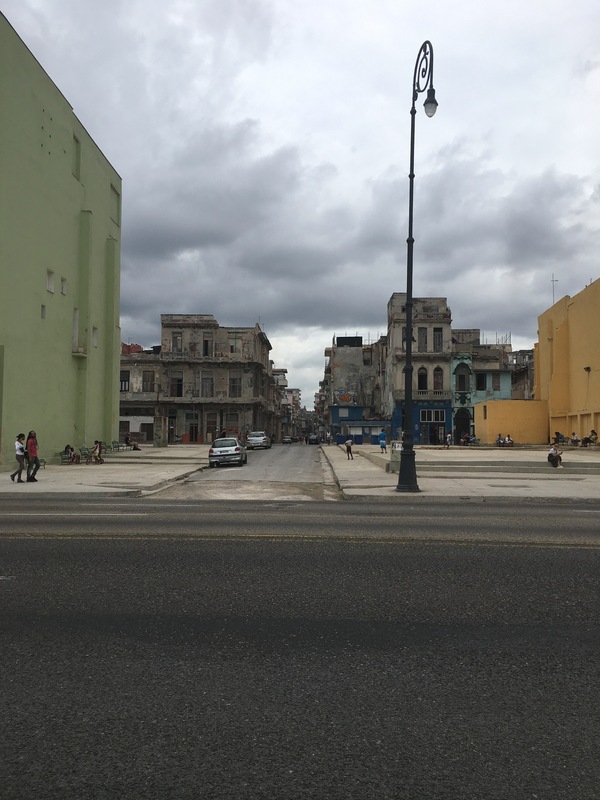 Without any historical context, the most remarkable thing about this plaza is its size. 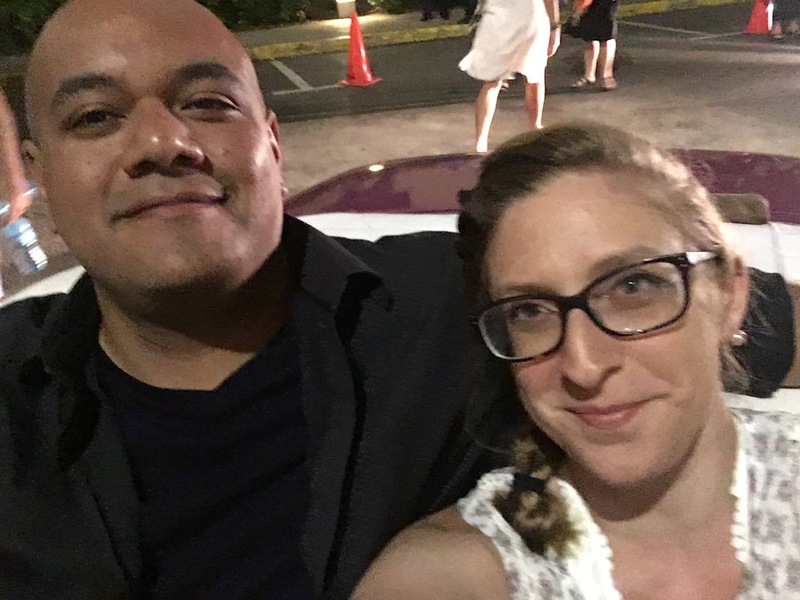 It felt like standing in a gigantic parking lot. With historical context, it’s a little overwhelming. 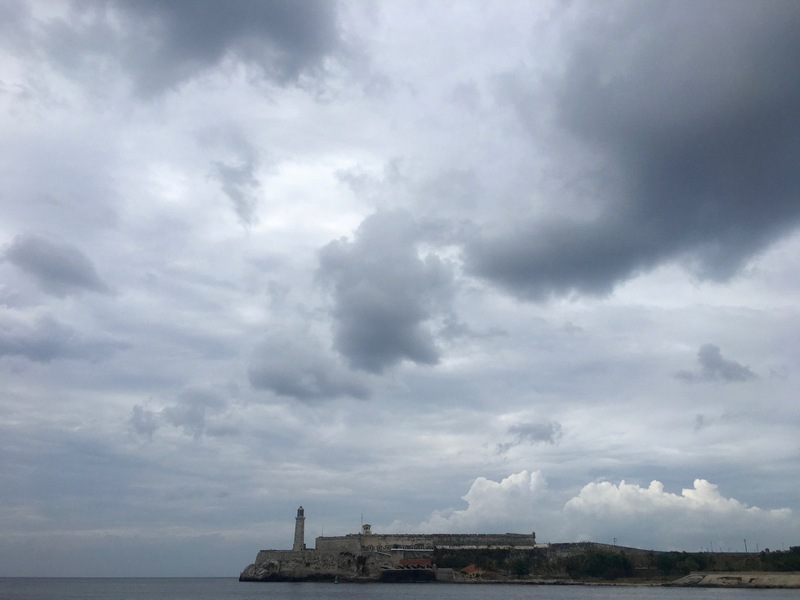 The José Martí Memorial honors a poet–journalist–activist who became a symbol of Cuban independence: The tower, if viewed from above, is a five-point star. Encircling the monument, broadly speaking, are several key government buildings. 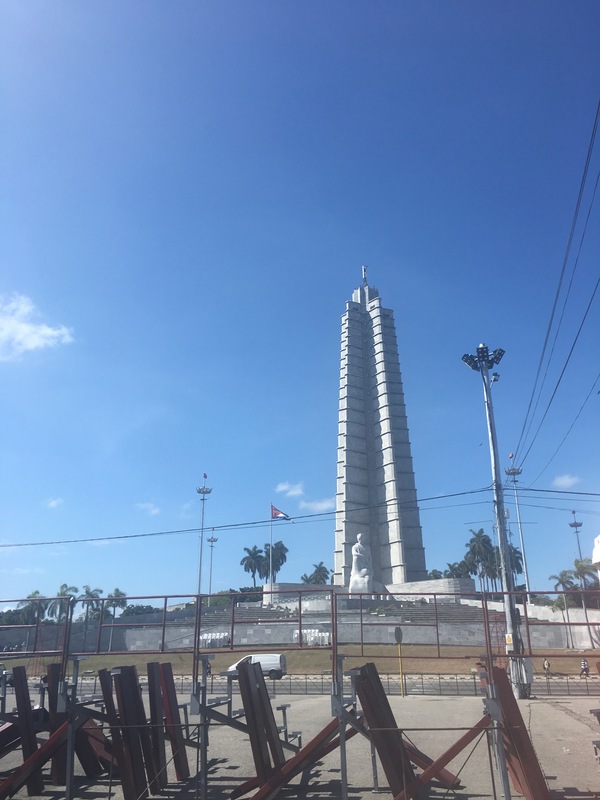 On the Ministry of Communications, there’s a steel memorial of Cienfuegos and his remark “Vas bien, Fidel” (“You’re doing fine, Fidel”). 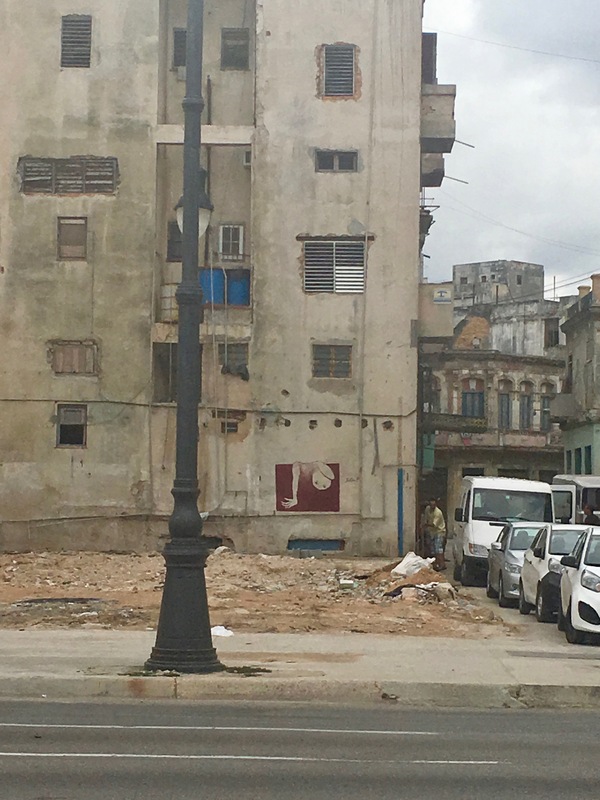 On the Ministry of the Interior, there’s a matching steel memorial of Che Guevara with the quotation “Hasta la victoria siempre” (“Until victory”). 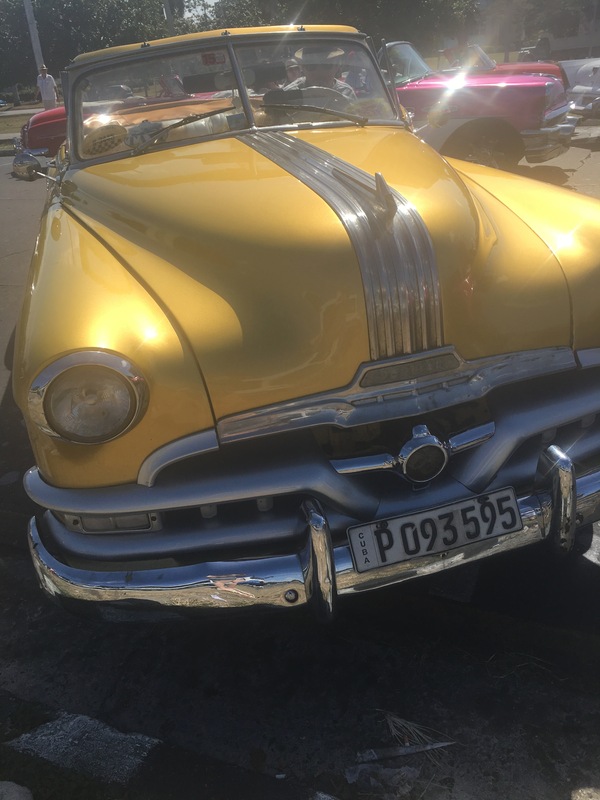 (3) We took tons of photos of fancy, shiny, old cars. 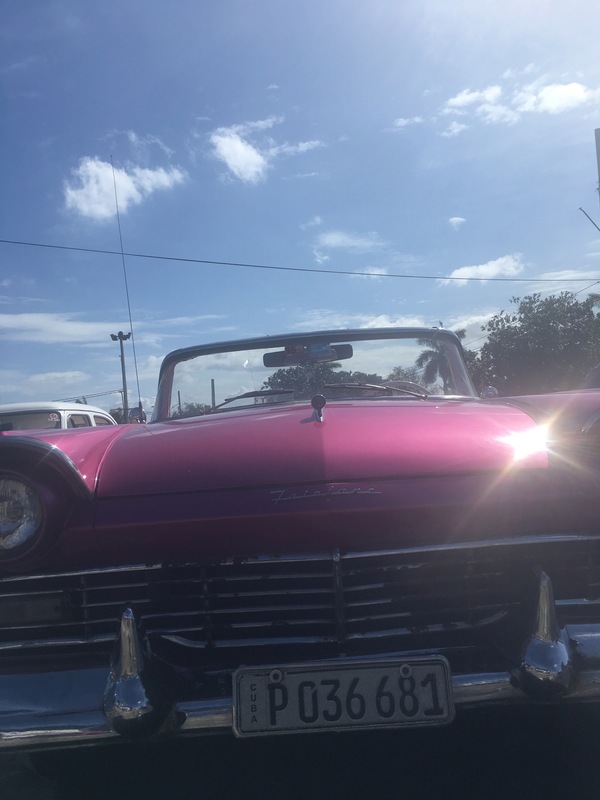 The cars on Cuba’s streets are characters themselves. 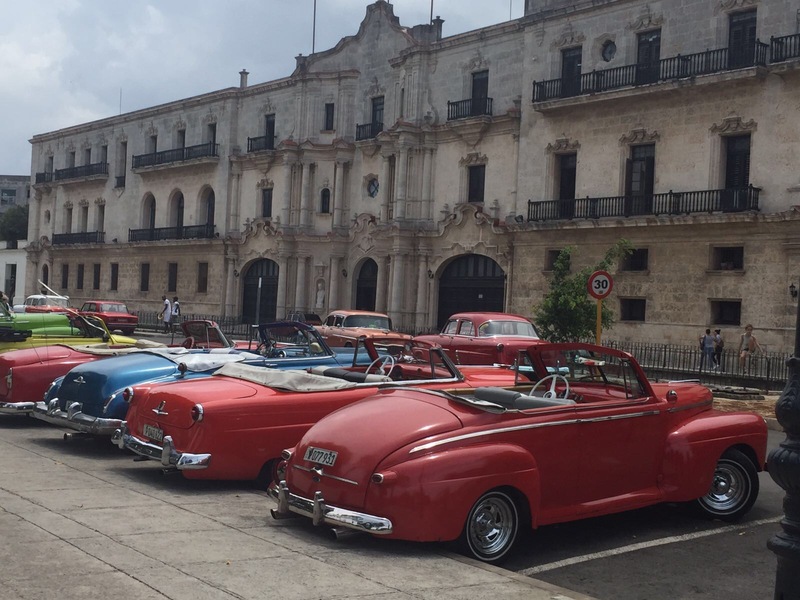 For about four decades, Fidel Castro essentially stopped importation of foreign cars… and foreign cars were basically all the cars. 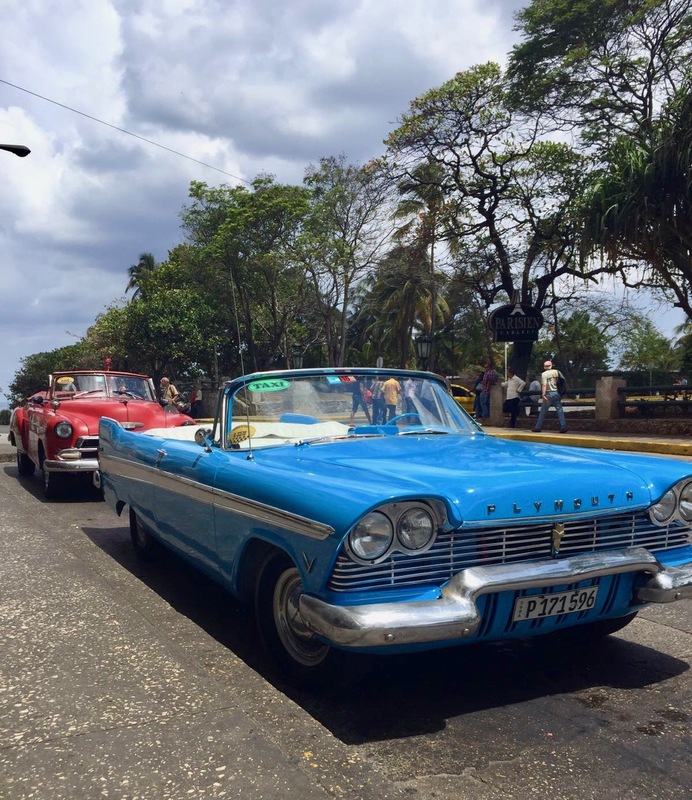 As a result, Cubans are still driving the cars that have survived since the 1950s. Under the hood, though, there’s a lot of bubble-gum-and-paperclip ingenuity: Once cars stopped coming in… so did car parts. 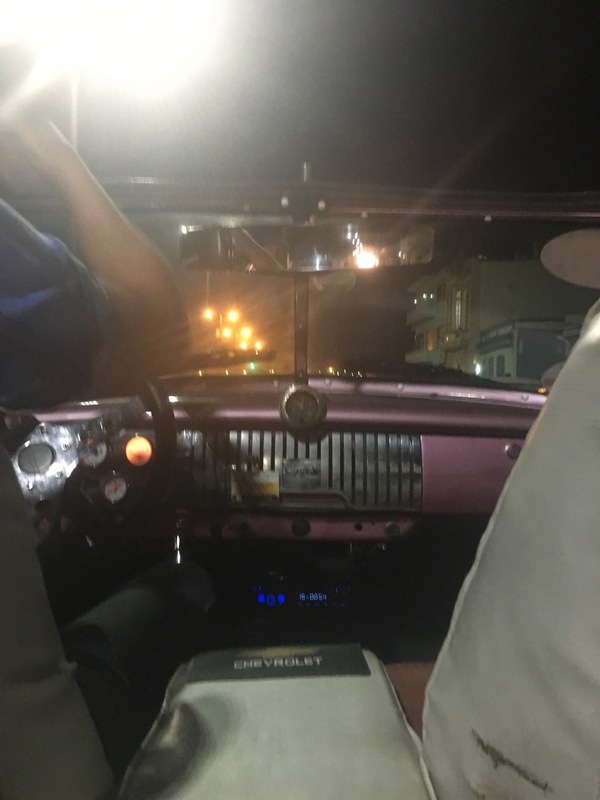 Ivo struck up a conversation with our driver one evening, and the gentleman talked about how challenging it had been to keep his family heirloom car running over the years. 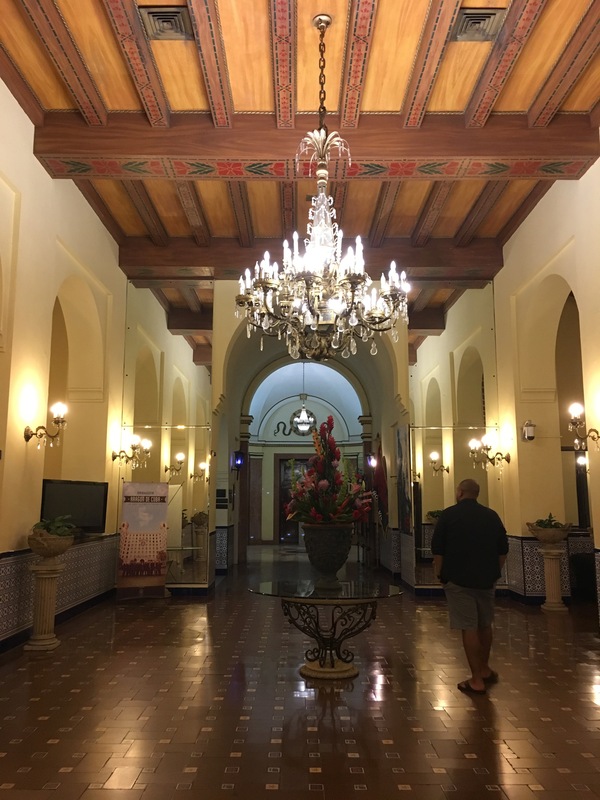 (4) We visited the Hotel Nacional and listened to live music. 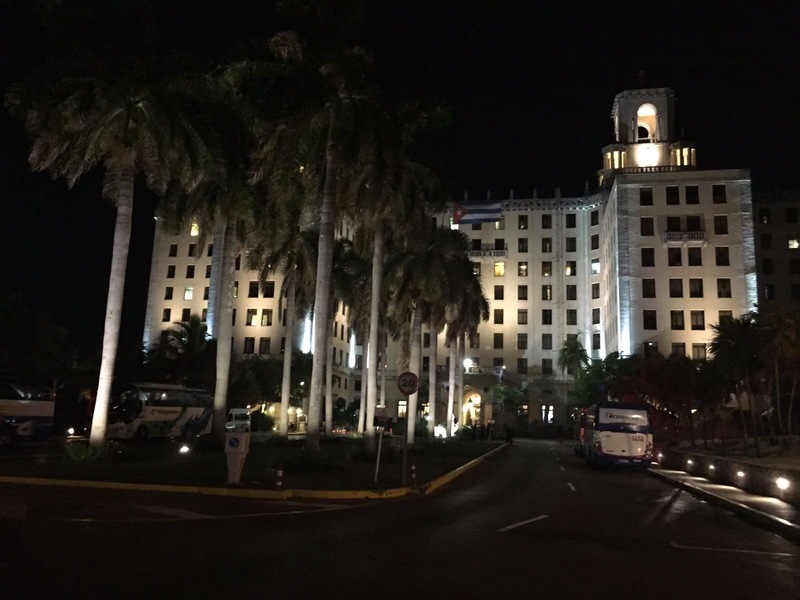 The hotel was originally built in 1930, then renovated in the 1990s. In short, it’s a Great Gatsby-esque time capsule. 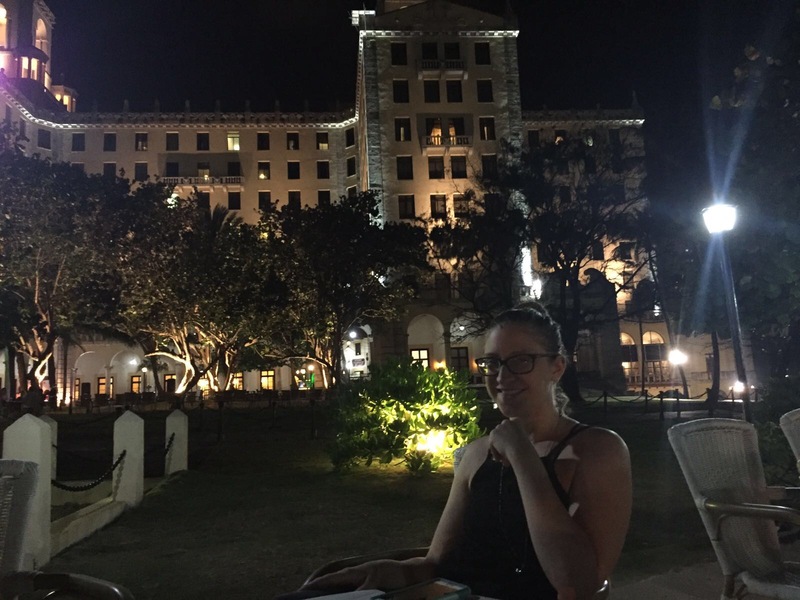 Ivo and I stumbled into their open plaza behind the hotel itself one night. 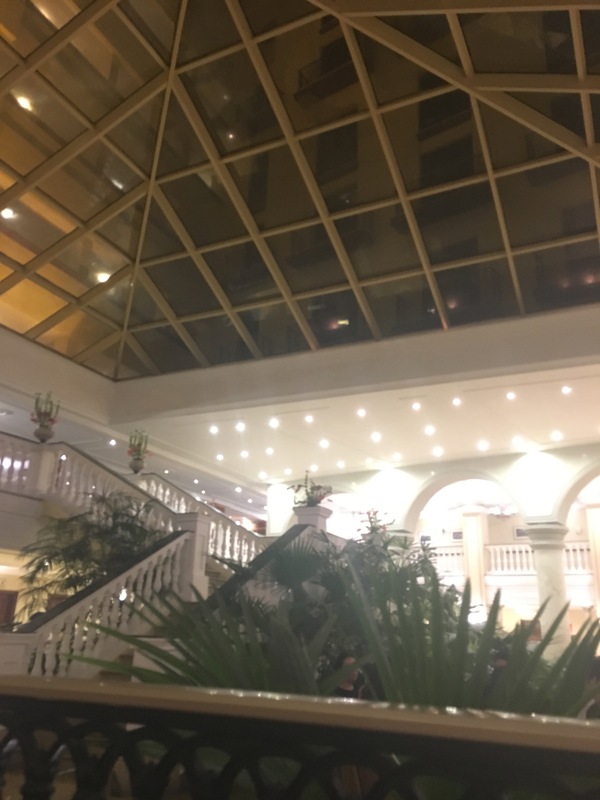 The music was so good, and the hotel was so beautiful, that we came back every night after. 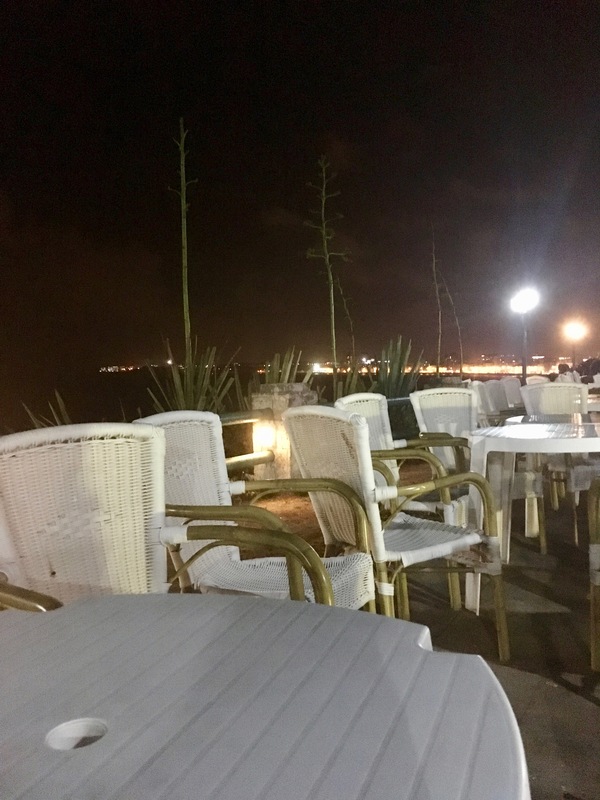 While there one night, we struck up a conversation with a lovely couple sharing a table with us. 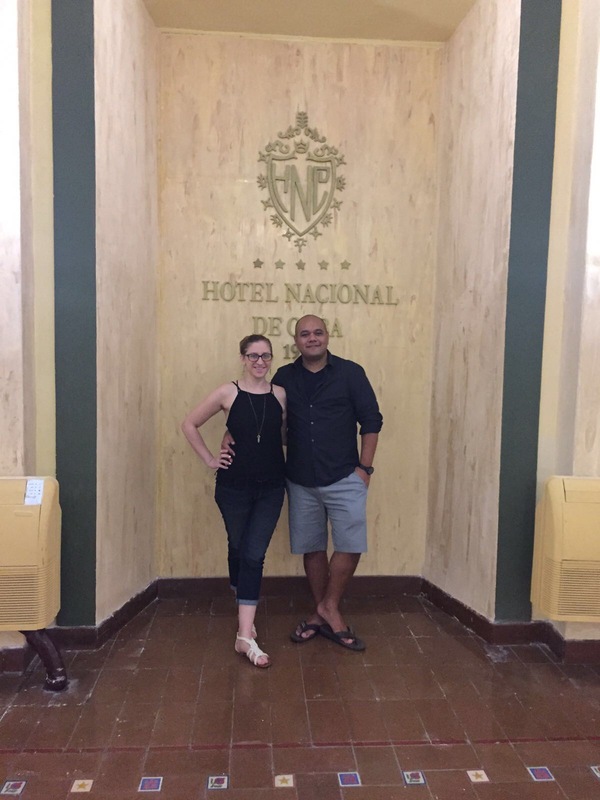 They were world travelers too, and unlike us, they’d ponied up and decided to stay a night in the Hotel Nacional itself. 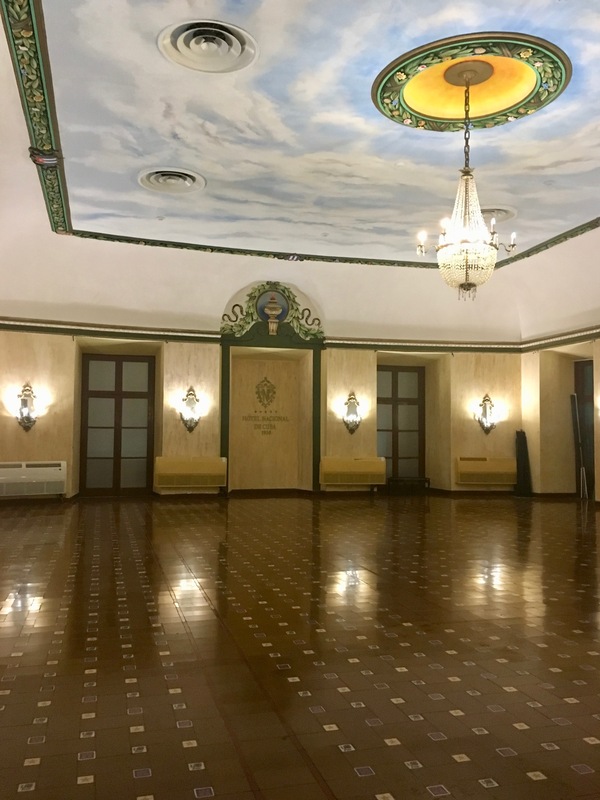 The rooms themselves, they said, really felt like you were time traveling. 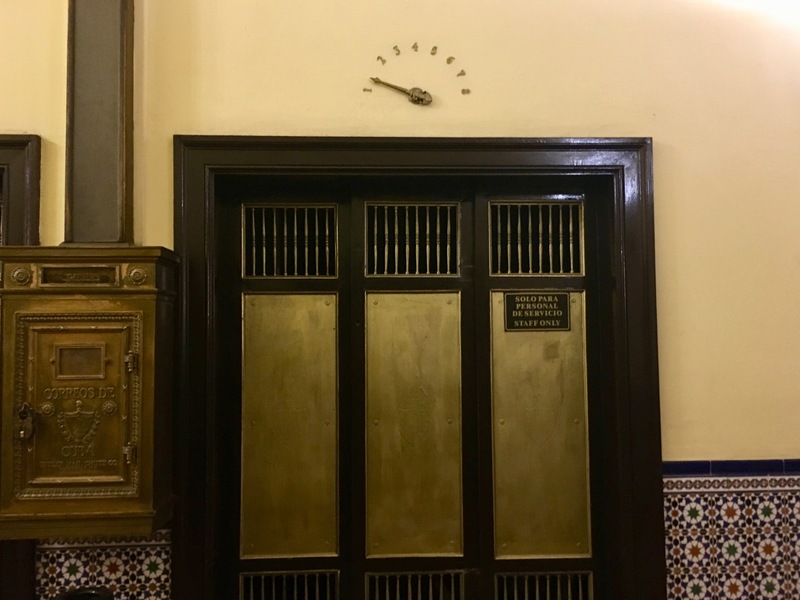 An old staff only elevator next to (I think) a mail box. 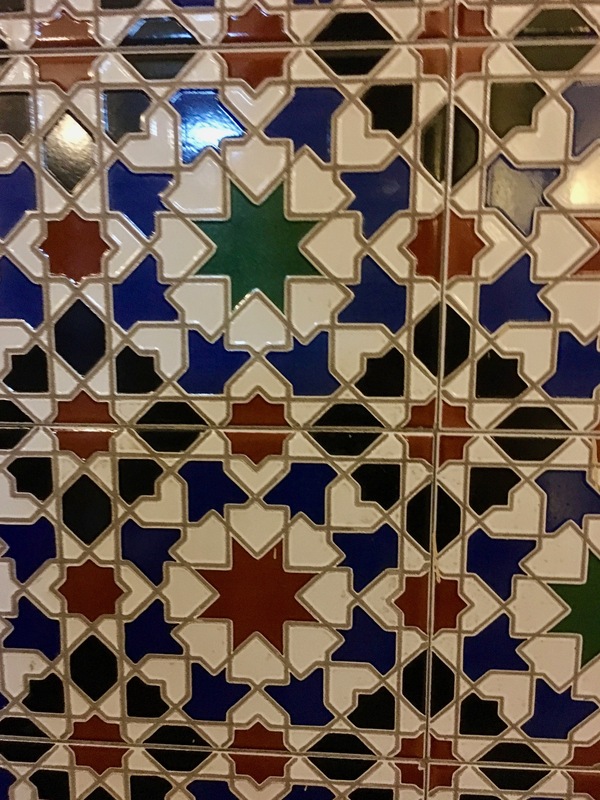 A closeup of one wall’s tile work. 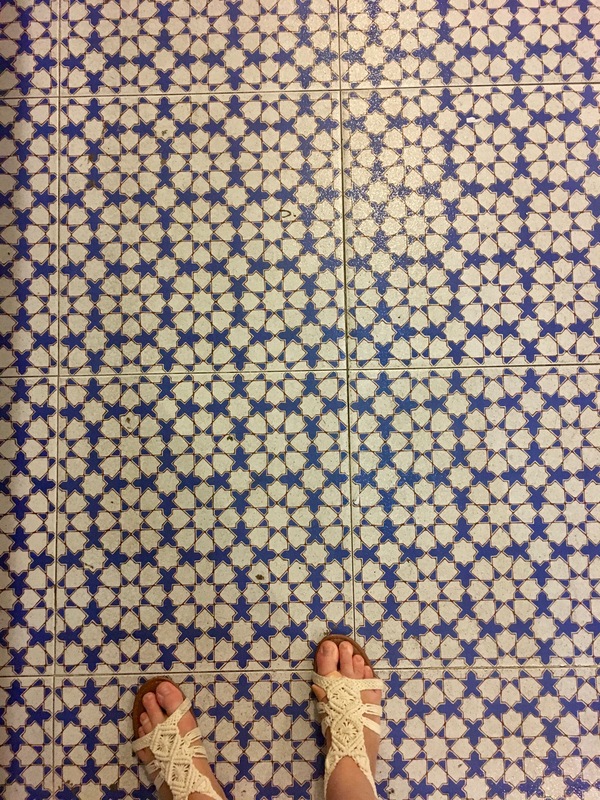 Beautiful tiles inexplicably hidden away in the women’s restroom. 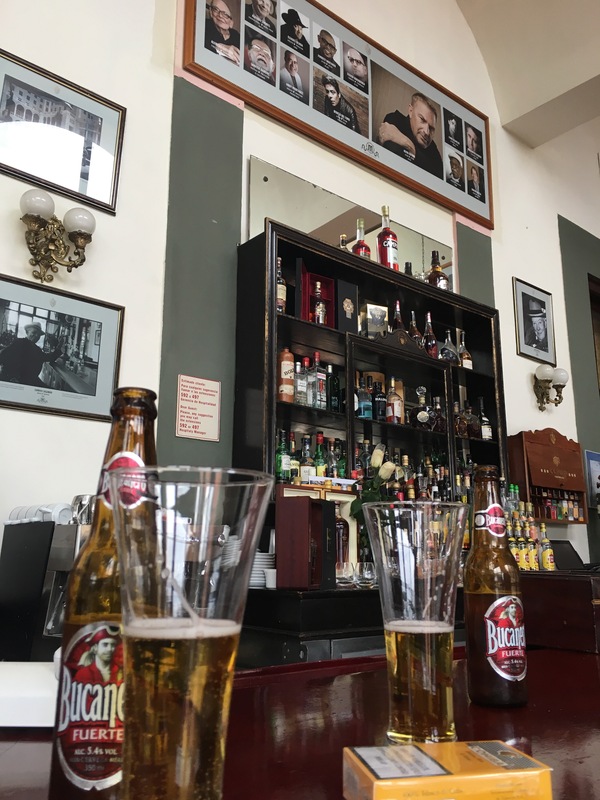 The interior of the hotel bar is famous for, well, hosting famous people. 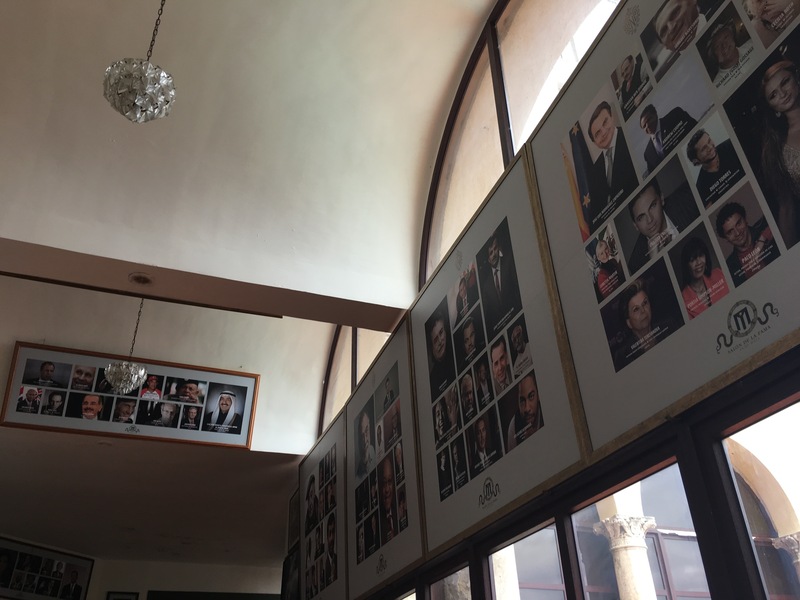 The walls are covered with photos of impressive past guests. 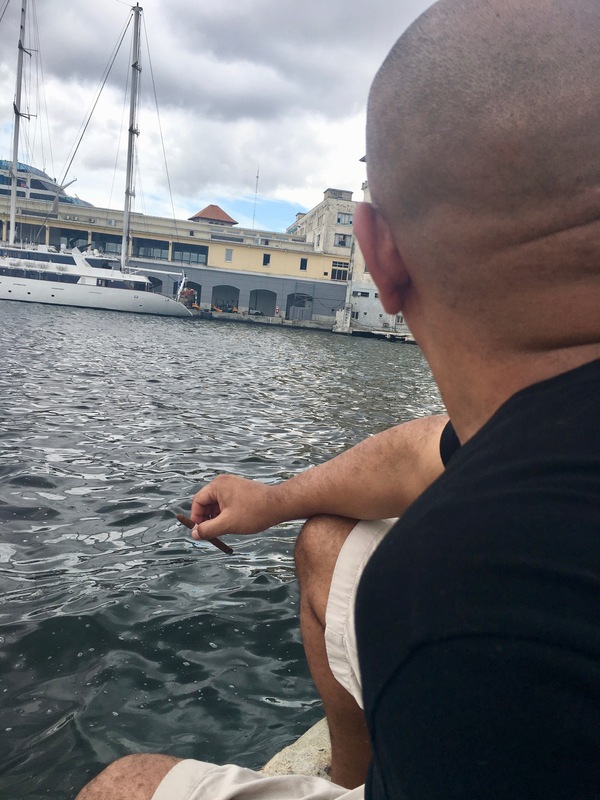 (5) We smoked cigars and drank (too much) rum. 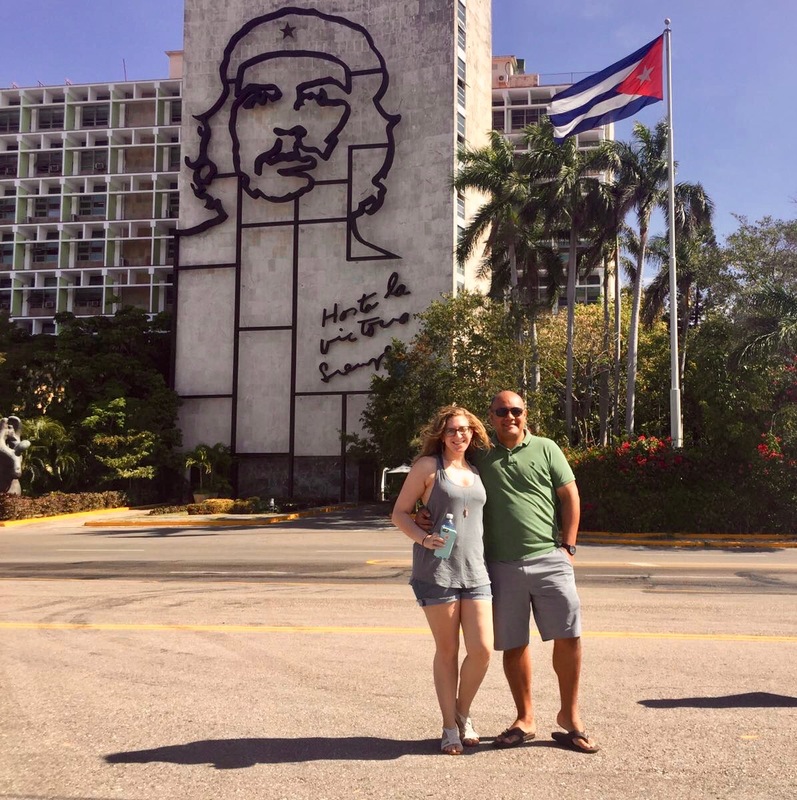 Maybe Ivo and I just didn’t know the hole-in-the-walls to visit… But frankly, all the food we had in Cuba was, at its very best, not terrible. Menu items often weren’t available, since the ingredients needed to make them weren’t available. 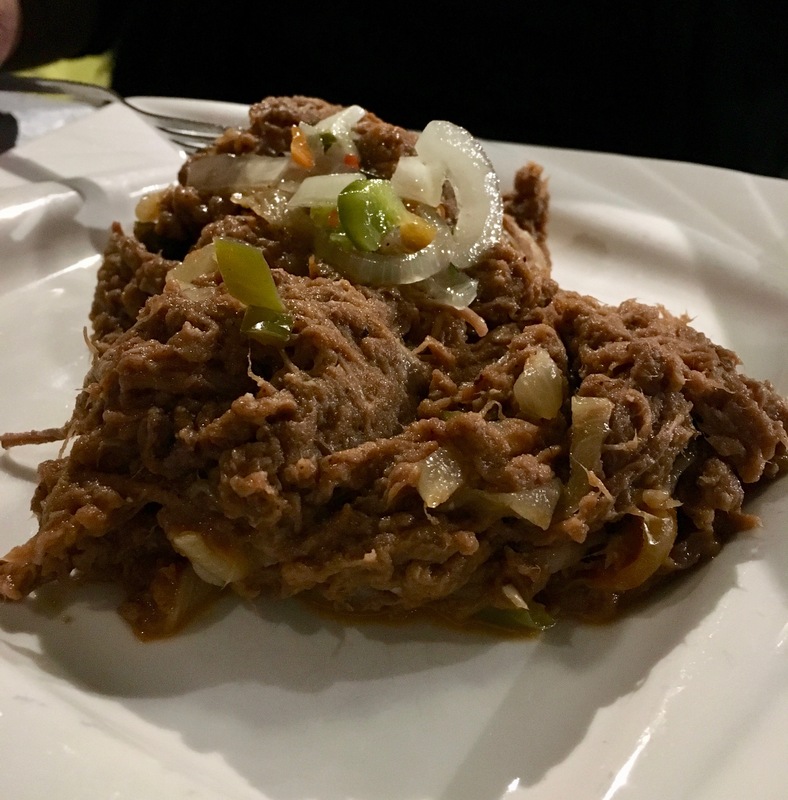 The only two consistently available meals were smoked ham and ropa vieja (translates to “old clothes”), which is a Cuban recipe for shredded beef. 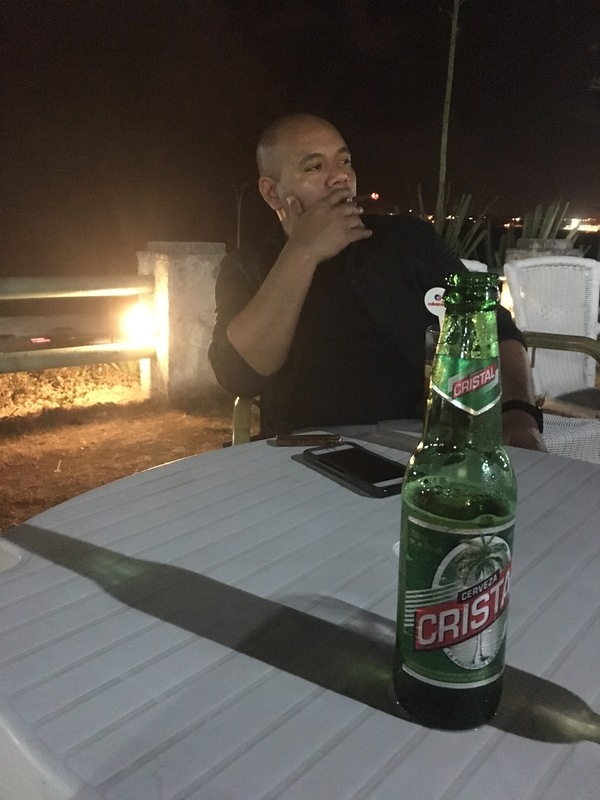 Look, even if that smoked ham had been the best I’d ever had (and it wasn’t), Cuba was like 80 degrees outside. That is not hot ham weather. And ropa vieja was about as inspiring as its name makes it sound. 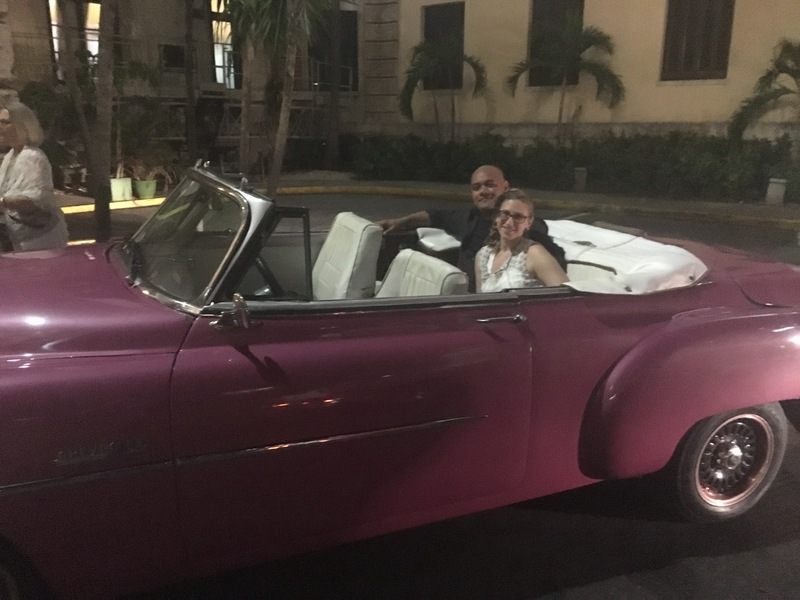 However, Cuba was not short on two luxuries: cigars and rum. 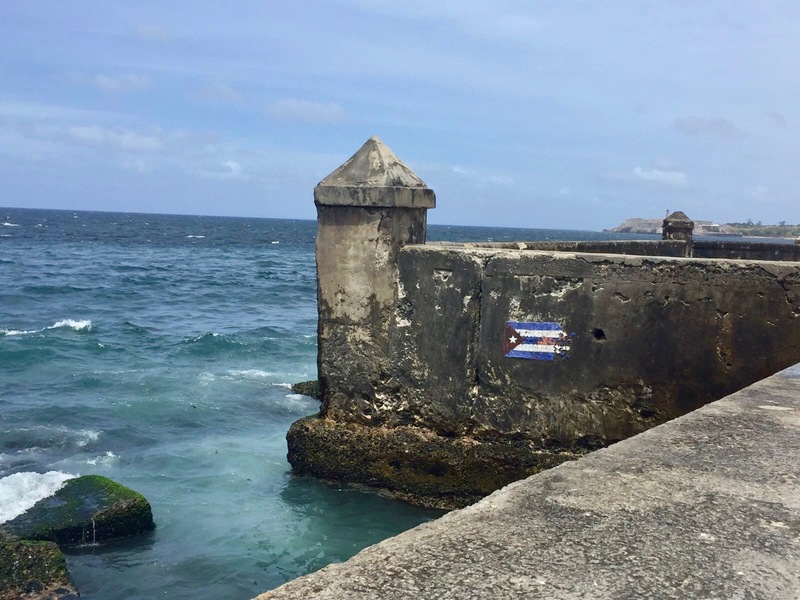 We visited a fort with a gorgeous overlook, a sugarcane juicing demonstration, and of course, a luxury gift shop packed with cigars and rum. 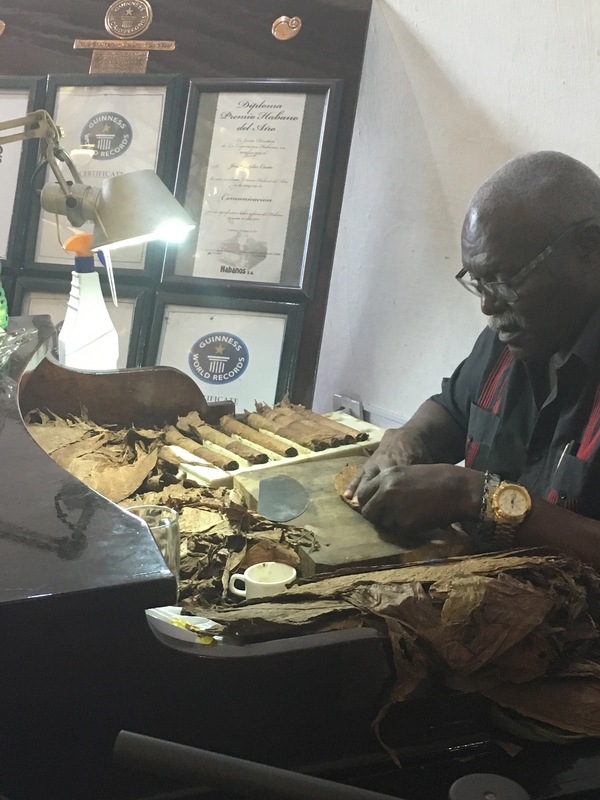 We got to see an expert at work, a man who has been rolling cigars his entire life. 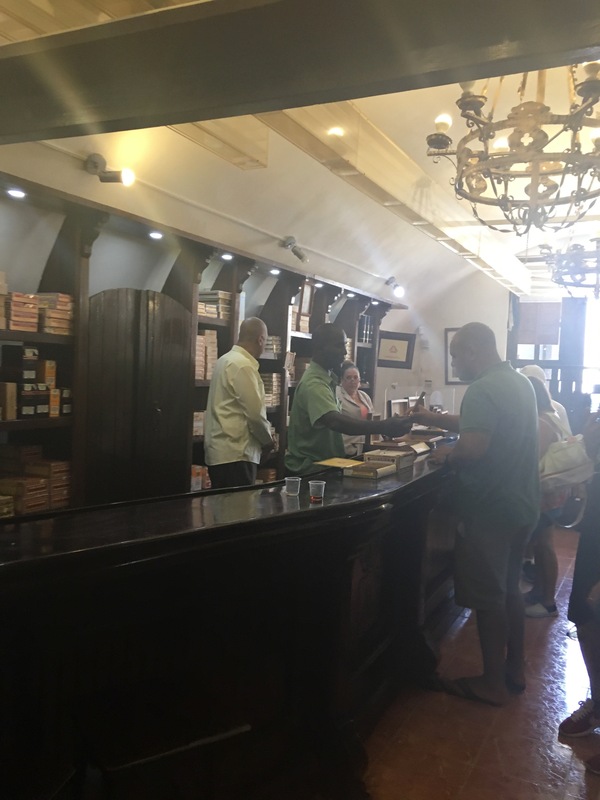 This same guy rolled the world’s longest cigar, which was draped around the gift shop’s ceiling (and way too gross to justify a photo). 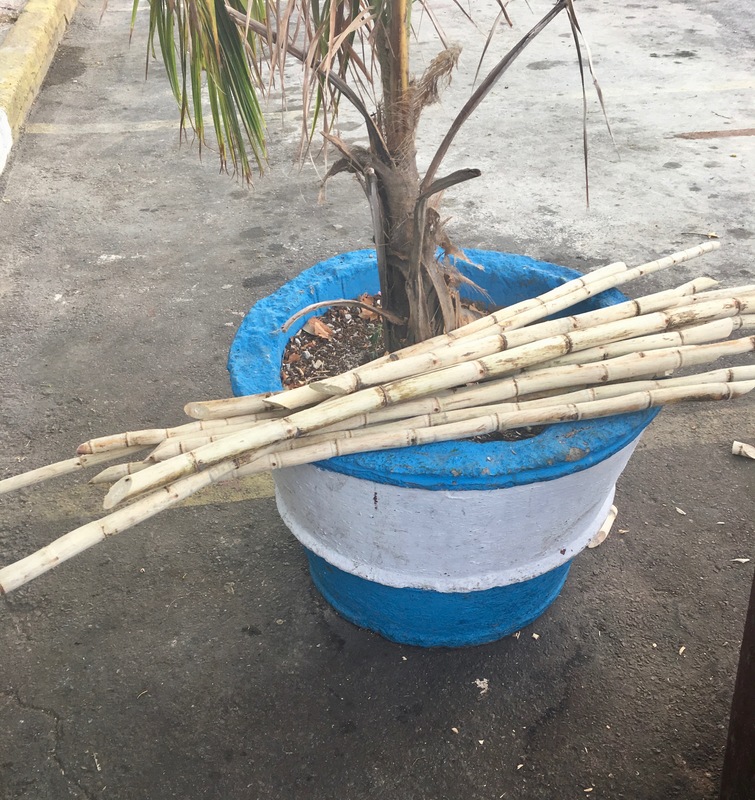 Sugarcane sticks ready for juicing. 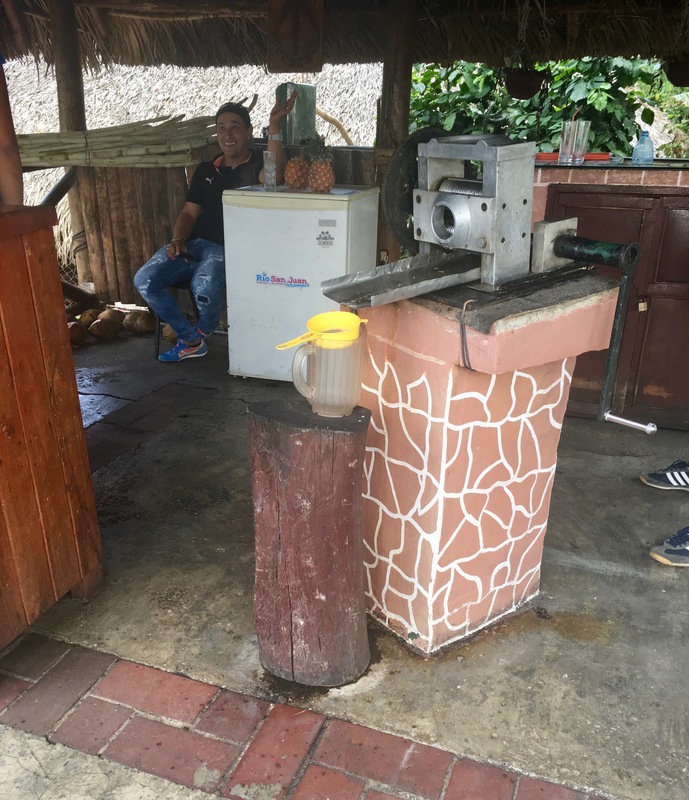 The juicer: The sugarcane sticks were ground through the machine by churning the crank. 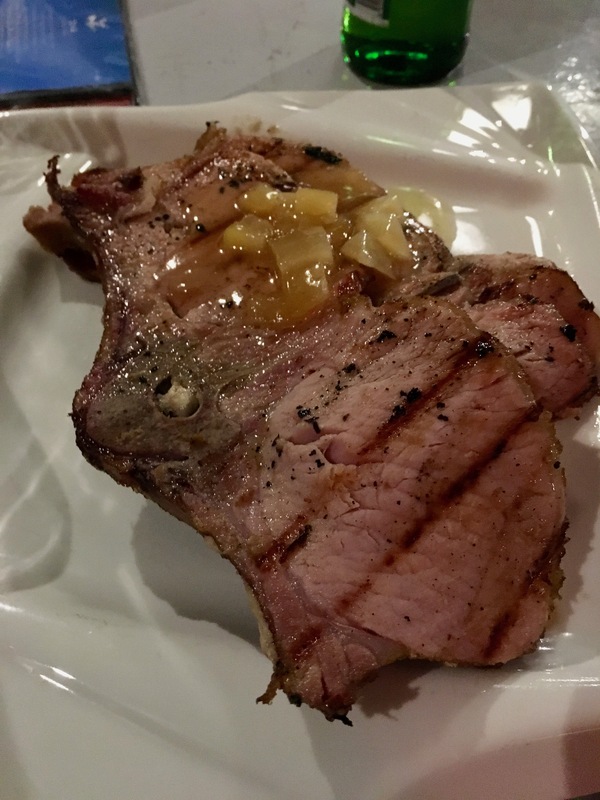 They were way juicier than I expected sticks to be… But the juice itself was amazing. The master at work. 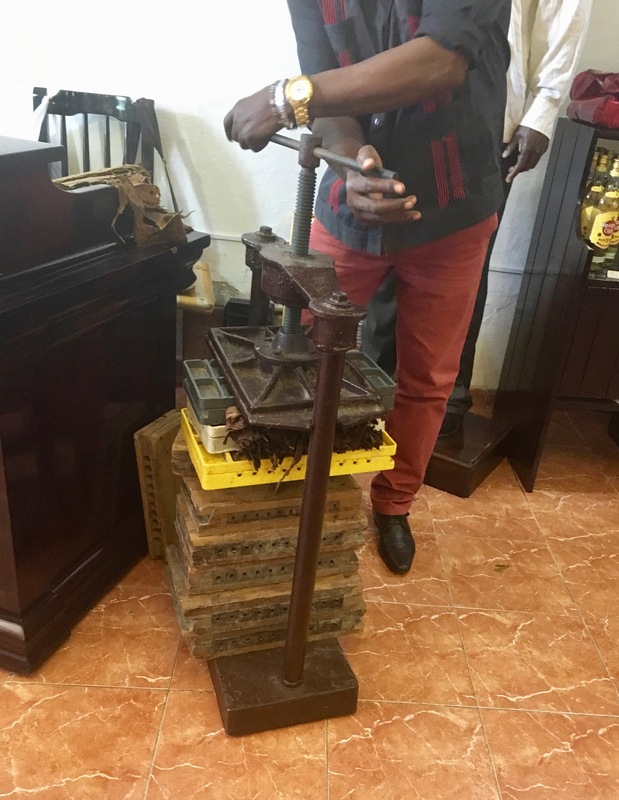 Cigars are made from those dried brown leaves, which have to be painstakingly rolled in just the right way, then pressed to keep their shape. 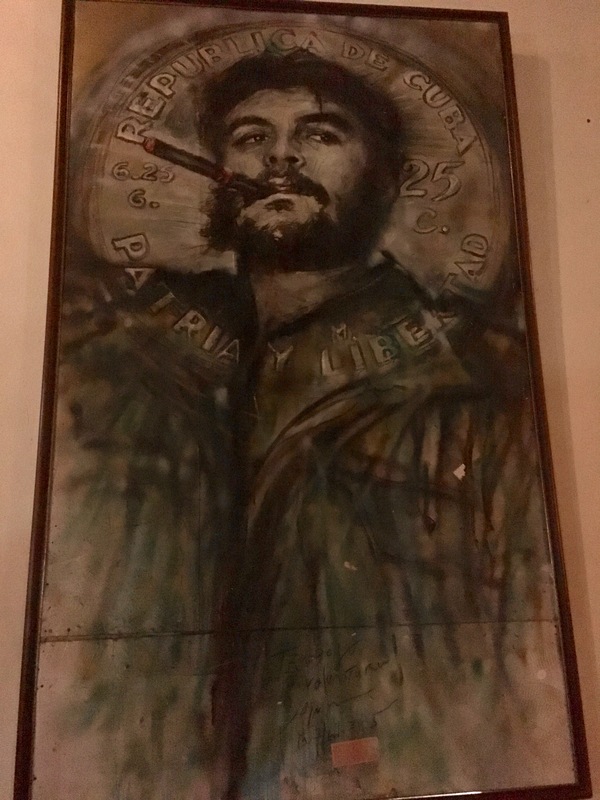 We heard a lot about cigars while we were in Cuba. Go figure. 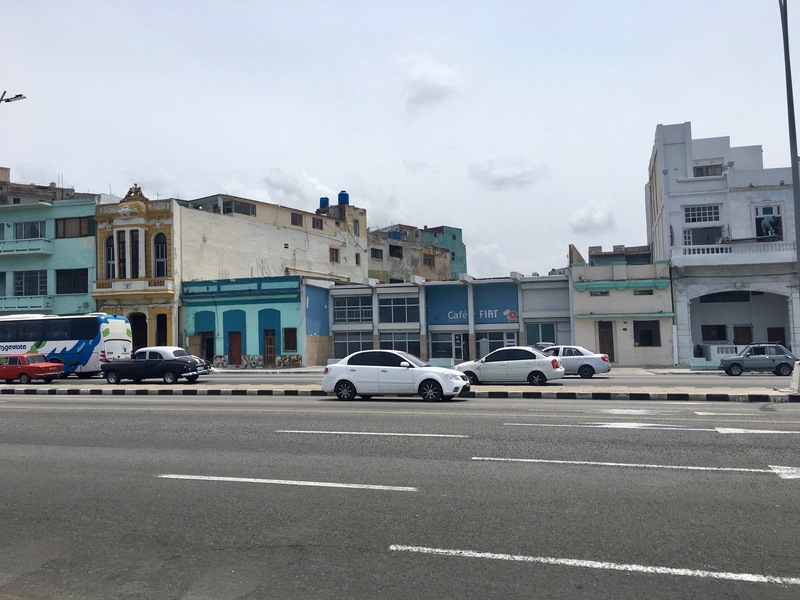 The best story was behind the names of two major brands: Romeo & Juliet cigars and Montecristo cigars. 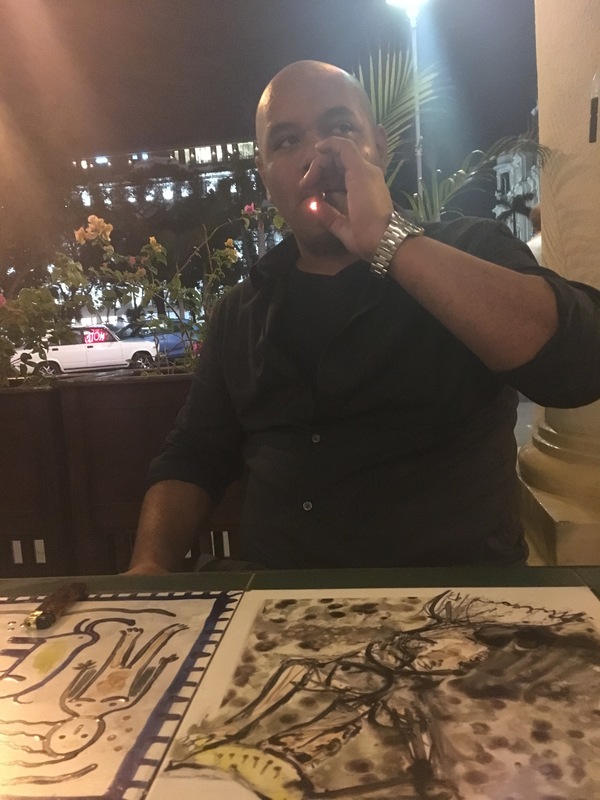 Apparently, making cigars is a very quiet process. 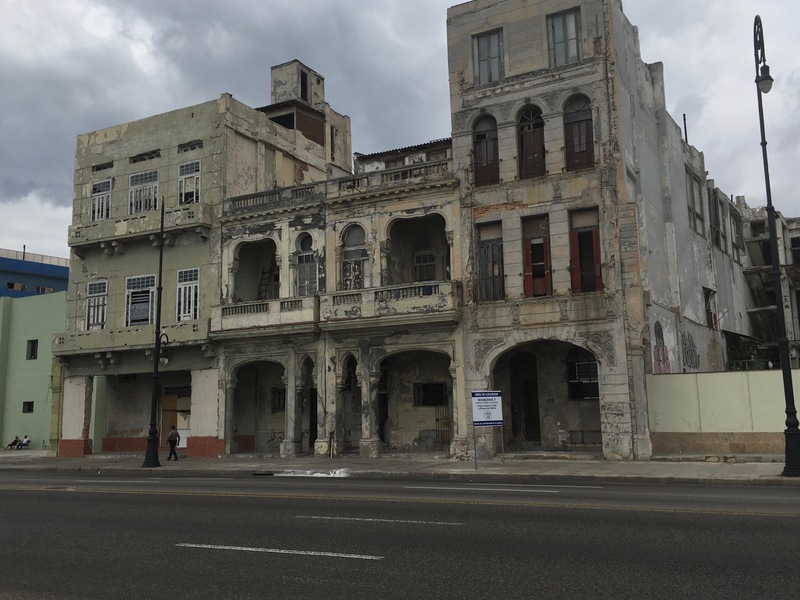 So when you had a cigar factory with hundreds of employees rolling cigars in dead silence, it got weird. To alleviate the silence and keep the workers alert, someone was hired to read Shakespeare aloud throughout the day. I’m asthmatic, so I only took a puff of one cigar to say I’d done it. The sensation was pretty interesting: You don’t inhale the smoke, like you would with a cigarette. Instead, you sort of hold it in your mouth, then slowly blow it out. Once the smoke is gone, you’re left with a rich, earthy kind of aftertaste. Ivo, on the other hand, puffed his way from destination to destination as we navigated the city. 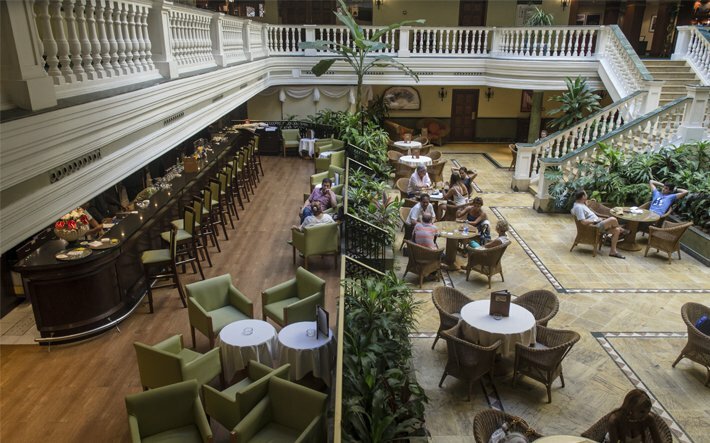 My own photos couldn’t do the whole bar/lobby justice, so I borrowed this one (above) from the hotel’s website. Ivo and I sat in the green chairs just next to the bar itself and listened to some live music. 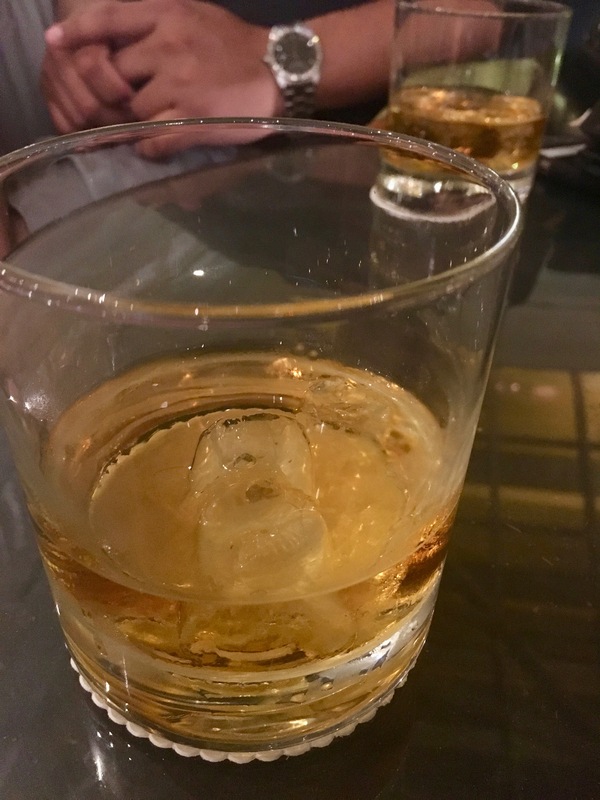 To bring our Cuban tourist experience full circle, Ivo ordered us each a glass of one of the priciest rums on the menu on ice. I don’t remember what it was, but I’m pretty sure whoever makes it would cry to see it dumped in soda. The taste and experience more than justified the price for me. 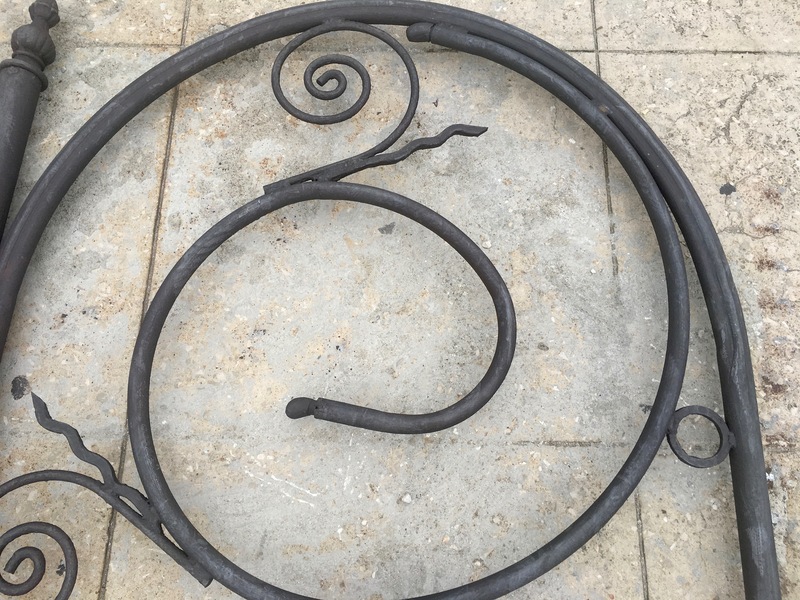 Awesome read and very exited we got a mention in the post!